"work done on schedule with competent workers with no..."
"Corey Johnson was extremely professional and explained what..."
"These guys were the best! Cory and Carter.very professional..."
This customer recently purchased a new home in Aynor and noticed that, like many of the newly built homes in the area, the living space was directly in the center of the building and did not have much natural light to fill the space. After some research, she found that Solatubes would be the best fit for her home. 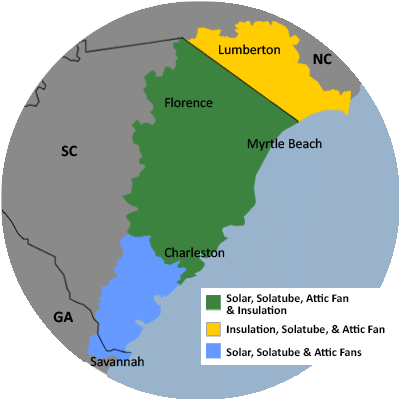 She called up the only local authorized Solatube dealer, and Carolina Energy Conservation installed two 14'' tubes in her livingroom and kitchen! This customer wanted to see more daylight in their home. A Solatube was installed in the living room and provides light to both their living area and kitchen. This customer was experiencing uncomfortable room temperatures when they noticed they weren't properly insulated. They gave Carolina Energy Conservation a call and our team evaluated the attic space and decided to blow in fiberglass insulation to help them conserve. For a FREE no-obligation estimate in Horry County, SC, please fill out the form to the right and Carolina Energy Conservation will contact you shortly. from day one every one was great!!!!! Loved the cheerful attitude of the guys working here. All 3 were really great and did an excellent job. The crew was excellent. It was a breath of fresh air to see a crew with not the most pleasant job in the world having such a great attitude. They showed a passionate desire to get all the details done correctly. Great job!!!!! Very professional from beginning to end. I will not hesitate to recommend your company to my clients that have flooring problems due to crawl space issues. Your crew installed motion sensor flood lights and undercabinet lighting quickly and efficiently. There was a problem with one balast not working, they replaced it the same day & kept us informed along the way. They cleaned up everything. We have already recommended you to others! Bright idea! Eddie works hard! Appreciate that the installers call when they are on their way with a 10-20 minute arrival time. Still waiting for before and after pictures that were promised. I want to have these fir FEMA. Paul H. Lakeside Crossing Dr.
excellent installer and salesman . very helpful in the help choosing the right product and quality of the installation!! will use him again with another installation. Everything was done professionally, expeditiously and as promised. Corey Johnson was extremely professional and explained what he was doing and why. He did not rush the job to get it done. I am extremely happy with the job he and his partner (David) did. They cleaned everything up when they were done. Almost looks like they weren't even there. Very good company and I will recommend this company and Corey Johnson to everyone. Very pleased. Carolina Energy Conservation is an authorized franchisee of the nationally renowned Dr. Energy Saver network of the best energy-conservation contractors across the country. We are not just a contractor company, we specialize in helping you understand your home's current energy efficiency, suggest repairs, and we also do the work! You'll receive the maximum energy and cost-saving results with least amount of hassle. We specialize in a variety of services aimed to lessen your home's carbon footprint and save energy and money each month! We offer it all, from air sealing to ductwork to insulation and HVAC services in Horry County, SC. For a FREE, no-obligation services estimate in Horry County, SC, you'll also receive a free copy of "Saving Energy and Money at Home," a great book to use as you begin to create a more comfortable, healthy, and energy efficient home! This homeowner was experiencing uncomfortable rooms in both winter and summer caused by their poorly insulated attic. Poorly insulated attics can have numerous effects on the efficiency of your home, resulting in high energy bills and drafty and hot/cold rooms. Carolina Energy Conservation easily solved this problem by first sealing all the air gaps then installing the fiberglass insulation. With these simple fixes the homeowner will see quick results in both their energy bills and the comfort of their home. Joe was interested in air sealing his attic space with spray foam insulation to help take some of the pressure off of his HVAC system. He gave Carolina Energy Conservation a call to schedule a free energy evaluation. After our comfort specialist went out to the home, he found that the homeowner needed much more than just spray foam insulation. Unfortunately, spray foam insulation alone would not increase the overall comfort of Joe's home. Joe needed a higher R-value to help keep his indoor temperatures, inside of the home. The CEC crew went out to the home, to help make Joe's living space more comfortable. Upon completing a full air seal of the attic, the crew installed fiberglass insulation to raise the overall R-value of the attic. Now, Joe is enjoying a nicely cooled home without any air leakages. Seeing Green in Green Sea! Pete was building an addtion on his home when he realized that, that would be the perfect place for solar panels! His high electric bill each month was becoming a real burden on his wallet so he did some research and gathered quotes from a few different solar companies. After much research, he found that Carolina Energy Conservation not only explained th quote in its entirety, but they also carry the top-of-the-line solar panels on the market. Pete had 31 SunPower solar panels installed on his home and is now producing 66% of his own electricity!